"I am not a professional gardener. Truth be told, I am not a very good amateur gardener either. I have never managed to work out what the PH of my soil is beyond north London clay, my cuttings rarely throw a shoot, the seeds I plant wither before they hit teenage-dom and on average, over the year, I doubt that I spend more than two hours a week gardening. Yet, somehow, I seem to have created this quite large London garden which evokes cries of ‘oh, what a wonderful garden’ from almost everyone who sees it..."
So how on earth did that come about? Let me see if I can work it out in ten easy moves…. 1. Buy the right house! By luck rather than good judgement we bought a Victoria semi way back in the 1970s with a wide, east/west facing garden surrounded by a low brick wall and a good sprinkling of mature trees – but all in other people’s gardens so that they did not create any light problems for us. It had one bed, a lawn and a load of scrubby bushes at the back. 2. Plant yourself a few small but decorative trees or large shrubs which will give colour, shape and interest throughout the year and take virtually no maintenance! Over the years I have planted a lovely acer (long since forgotten its name) which is now about 35 foot high. It has delicate pale feathery green leaves in spring, maturing to slightly darker over the summer, spectacular copper autumn colour and then red bark throughout the winter that, when everything else is looking grey and depressing in the rain, positively glow. We have a small grey weeping pear – the second one in fact as the first got entirely overshadowed by a bay and then had to give way to a football pitch! A couple of silver-barked birch trees which do not do a lot in the summer but are quite striking down the bottom of the garden in winter. A golden ash – a relatively recently recent planting which I may regret as I suspect that it is going to get a lot too big over time. But at the moment it too has delicate pale green leaves in spring, lovely golden yellow autumn leaf colour and yellow bark throughout the winter. 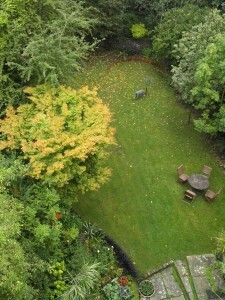 I also have a golden acacia (Robinia pseudoacacia risia) down at the dark bottom of the garden whose glorious fluttering golden leaves are a focus throughout the summer. Mind you, this is has not been easy and I am afraid that I am now on my third tree…. Acacias are sun loving, almost desert trees so to try to grow them in the dark, soggy and sunless bottom of a London garden is asking for trouble. The first two made it through about ten years each, not growing very strongly but quite enough to create their effect before being killed off by particularly wet winters. I now have a third planted in a massive and very well drained pot in the hope that even if it does not get too much sun, keeping its roots relatively un-sodden might keep it alive! I also planted a vibrant blue ceonothus, now trimmed into an umbrella shape, and inherited some very rampant orange blossom bushes. 3. Create yourself a focal point in the garden that can be made to look spectacular with relatively little work. A free August, combined with a nephew on his gap year and in need of work, resulted in the construction of our ‘summer house’ at the bottom of the garden where it catches the evening sun. A fine construction with a verandah for sipping Pimms, I covered its roof with sedum. Again, completely the wrong place to put rock plants as the roof is quite overhung by the surrounding trees, but it has survived. But the house also allows me to have one very specatular hanging basket – I find that begonias are the most successful – and one spectacular tub, both of which really catch the eye from the house but which need very little work beyond watering. 4. Do not have children who want to play football, rugby, cricket, baseball. 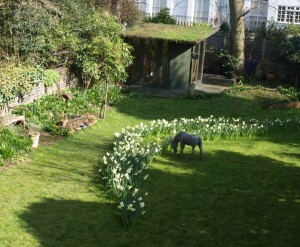 There was a ten year hiatus in the 35 year development of our garden while it did service as a football pitch! 5. Do not grow vegetables. I feels seriously guilty about this as I am a food person! I write about food, I create recipes, I run awards for good healthy food and there is nothing I like better than spending an afternoon in a beautifully maintained Victoria kitchen garden . So why am I not growing food – apart from a few token pots of herbs?.... Well, veg are trouble! They take a lot of effort and a lot of input and, unless you are very skilled, normally look a mess!! They would definitely force me to exceed my two hour a week average input time so, although I regularly beat myself up over it, I continue to exclude them – although I was thinking of trying to sneak some rainbow chard into my herbaceous patch this year…..
6. Do not have too many flower beds and plant what you have with lots of perennials. They do need a bit of work in terms of staking when they are growing and cutting back in the autumn but they are pretty trouble and work free. They also provide lots of excitement in the spring if you, like me, can never actually remember what you have got in there, as new plants reappear after their winter hibernation! I really only have one decent sized flower bed which includes a choisia, a big miscanthus grass, a couple of roses, some poppies, a cardoon, some hellebores, irises, delphiniums and agapanthus. A bit of a random collection but they cover most of the summer months and it is very easy to fill in any gaps with jolly annuals such as petunias, begonias, cosmos, marguerites, tobacco etc which can easily be replaced if they struggle. I also have a bank of geraniums that I top up with the odd new plant each year and cut back each autumn and not only do they provide gentle but pleasant colour in the garden but pretty cut flowers for the house throughout the summer. 7. Install an automatic watering system. Absolutely essential for labour saving gardening and very easy (and quite fun) to install. I have a rambling system which actually covers most of the garden and is very easy to add to, or to adapt, to keep the odd pot or tree well watered if you need to. This is also a Godsend if you travel as you can get little computers which will turn the system on and off in your absence, keeping your garden watered and happy while you bomb round the world! 8. Think, early, about slugs and snails!!!! They were never that much a problem until I started my love affair with delphiniums and since then I have fought a constant and usually losing battle. I have now installed a small pond to attract frogs to get fat on the slugs although, to date I have not actually attracted any frogs…. But this is only year two so I have hopes! Mind you, I am not too sure how much good thinking long and hard will do you as we still await the definitive way of keeping them at bay. Over the last two years I have kept Foster’s lager in business by putting out beer pots (very successful if heavy on yuck factor when you have to empty pots of rotting slug…). This has worked well for the delphiniums and petunias but failed abysmally around the hostas. This year I am about to spread thick layers of mineralised straw mulch round the hostas…. 9. Do not get hung up on a beautiful lawn! Over the years ours has got invaded by daisies, moss and now MindYourOwnBusiness which I am actively encouraging in the tree-shaded back of the garden where even the daisies struggle a bit. Maintaining a perfect lawn is incredibly hard work and frustrating as the least little thing can ruin its perfection. A lawn low on grass but high on other lawn plants needs far less maintenance (forget all that scarifying business! 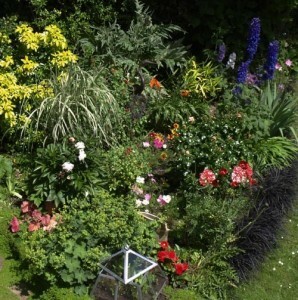 ), less mowing, less watering , is far gentler on the blood pressure – and looks really pretty!! 10. Occasionally allow yourself to go mad. Three years ago a friend presented me with a sack of Ice Folly narcissus and then arrived on the doorstep to help me plant them. A sack is an awful lot of bulbs and she insisted that I could not shove them all down at the back of the garden where they would get no sun. So we decided to plant them in a great Nike tick down the centre of the lawn! Very hard work as we had to dig up the turf to plant the bulbs – but spectacular they certainly are each spring!! This year I have also planted poppies in the middle of the tick in the hopes that when the daffs die off but the leaves are still there, a blast of scarlet and pink poppies will take over the show! !